Demonstrating listening device, very similar to a telephone, used on board ships with submarine signaling apparatus. In: “Submarine Signaling,” Scientific American Supplement, No. 2071, pp. 168-170, Sept. 11, 1915. Image courtesy of NOAA Photo Library. Toward the end of the 1800’s, increasing ship traffic raised concerns about navigation. Additionally, the bright lights and loud sirens emitted from lighthouses and lightships did not travel far enough to warn ships about the dangers of shallow waters and rocks. In 1889, the American Lighthouse Board mentioned an alternative underwater bell and microphone system devised by Lucien Blake. In 1901, a group of scientists, who believed that underwater sound would provide the most reliable warning, formed the Submarine Signal Company. In developing equipment to be used for increased navigational safety, the Company may have, perhaps, applied the first practical use of underwater sound: underwater bells located under lightships or near lighthouses that could be detected by receivers installed on ships. The carbon-granule microphone developed by Thomas Edison and his collaborators for the first telephones was installed in a waterproof container, serving as the hydrophone to receive the underwater bell signals. Reginald Fessenden and the Fessenden Oscillator. In “Submarine Signaling,” Scientific American Supplement, No. 2071, pp. 168-170, Sept. 11, 1915. Image courtesy of NOAA Photo Library. Unfortunately, the ship-mounted hydrophones also picked up background noise, including ship machinery, splashing water, and fish, which made it difficult to hear the bells’ sounds. 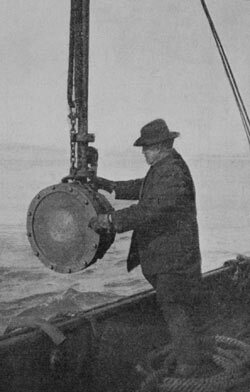 In mid-April 1912, the Submarine Signal Company asked a consulting engineer, Reginald A. Fessenden, if he could redesign the hydrophones to filter out such noise. Fessenden suggested that the sources (bells) be improved instead. He proposed replacing the bells with louder, electric-powered sound generators designed to produce an audible tone in order to send the dots and dashes of Morse code using acoustic signals. The Submarine Signal Company was not interested in developing an improved source, however, so Fessenden agreed to design a more selective hydrophone. The sinking of the passenger ship Titanic on April 14, 1912, might have further encouraged scientific discoveries. Within a week of the ship’s tragic collision with an iceberg, L. R. Richardson filed a patent for an invention that used sound and its echoes off objects to determine distances in air. This technique is called echo ranging. A month later, he filed a patent application for doing the same thing underwater. However, at this time, an appropriate acoustic source still did not exist. 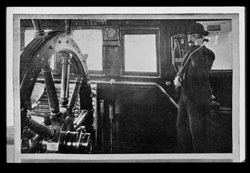 In January 1913, he transmitted messages several miles between two tugboats in Boston Harbor using the new oscillator. A year later, Fessenden conducted echo-ranging trials. He was able to detect a 130-foot high, 450-foot long iceberg more than two miles away. He also successfully detected the seafloor at a depth of 31 fathoms (186 feet). Despite these encouraging results, the Submarine Signal Company decided not to market an echo ranging system or an echosounder. It was not until 1923, following World War I (WWI), that the company put into production a low-frequency echosounder based on the Fessenden Oscillator. They called the echosounder a “fathometer” because depth was measured in fathoms. By the mid-1930’s, practically every submarine used an underwater telegraph system based upon the Fessenden Oscillator.